Hi there! 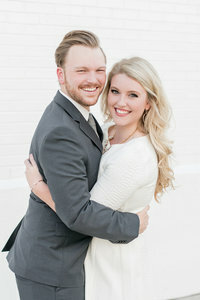 We're husband and wife wedding photographers out of Birmingham, Alabama. Here, you'll find our weddings, engagements, and other happenings. Sit back and stay a while! Hi there! We're husband-and-wife wedding photographers out of Birmingham, Alabama. Here, you'll find our weddings, engagements, and other happenings. Sit back and stay a while! Maggie and Austyn had a gorgeous holiday wedding day in Anniston, Alabama. After hair and makeup at the Hotel Finial, Maggie and Austyn exchanged vows at Sacred Heart Catholic Church before dancing the night away at Anniston Country Club. Their ceremony was heartfelt and beautiful, and guests had a ball dancing to Park Band until sending these two off as husband and wife! We loved the personal touches in this wedding day. Maggie and Austyn love the Christmas season, so they embraced the holiday and adorned their wedding day with Christmas trees, twinkle lights, evergreen wreaths and even gave Christmas ornaments as wedding favors! Since they are dentists, they had the cutest little teeth cake toppers (you’ll see below! ), and because their first date was at the world famous Milo’s Hamburgers, Austyn wrapped Maggie’s gift in a Milo’s hamburger wrapper!! It was perfect! Maggie and Austyn, we love y’all so much. We consider ourselves lucky to know you and call you friends! You’re an incredible couple with an incredible love, and we know the Grissoms are a strong power couple who will do amazing things!! Congratulations, newlyweds! We wish you all the love and happiness in the world!